This direct vent wall furnace by Empire efficiently generates up to 10,000 BTUs with 60 cu. ft. per minute output. This furnace features easy through-wall venting that requires no chimney, and comes with the matchless piezo ignition system. This furnace requires no electricity and it includes standard vent kit for venting through an outside wall, and both propane and natural gas models are available. Is a 100 lb propane tank sufficient to run this heater? A 100 lb tank should indeed be sufficient for this unit. How many square feet does this Empire wall furnace heat? 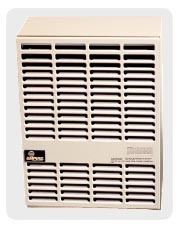 This heater will heat approximately 200 square feet with standard 8' ceilings. What is the AFUE for this unit? Per the manufacturer, the AFUE for this appliance is 62%. How much propane does this furnance use per hour with a normal operating level in a 10x12 room? While propane use varies model to model, the general rule of thumb is 21,000 BTUs in a pound of propane and 91,000 BTUs in a gallon. Thus, this 10,000 BTU heater will consume about 1/2 of a pound of propane every hour and a little over 10% of a gallon of propane in an hour. When the heater is only using the standing pilot light, 1,000 BTUs per hour are consumed. Is this unit ok for installation at 6,000' ft altitude? This unit is indeed safe for use at your elevation. However, gas pressure adjustments and air shutter adjustments must be made to allow proper operation. The owner's manual contains a chart that will have this information and the correct adjustments that need to be made for the respective elevation. This wall furnace weighs 40 lbs. Can I mount this high up a wall behind and way above toilet? Technically, this unit can be installed on any outside wall and can be utilized in any location that will allow for the proper clearances to be maintained. However, the manufacturer advises that this unit is better suited to a large, open wall area so that heat will distribute more evenly and so the unit can be serviced easily. It would be best to consider this in your installation, as you will get much better results out of the unit in the long run.